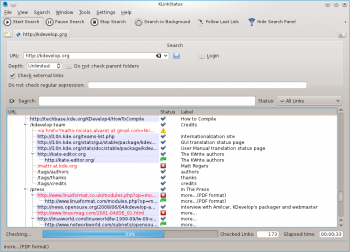 KLinkStatus is an utility to check links on web pages or local files. Ability to search internal and external links in your entire web site or just a single page. Ability to check local files, ftp, fish, etc. using KIO. Ability to open pages and referral URLs directly from application's GUI. Scheduled checks (daily or hourly). Ability to export results in HTML using CSS from GHNS. This page was last modified on 15 October 2014, at 16:22. Content is available under Creative Commons License SA 4.0 unless otherwise noted.